The Busanga Plains in western Zambia have been on our wish list for some time now. Not least because they are one of those remote areas that host low-density tourism, in a world where many ‘remote’ places are becoming overrun by indiscriminate tourism. Due to Busanga’s remoteness, inaccessibility and few accommodation options, it’s likely to remain that way for the foreseeable future. Red letchwe jumping the channel, Annabelle Venter. 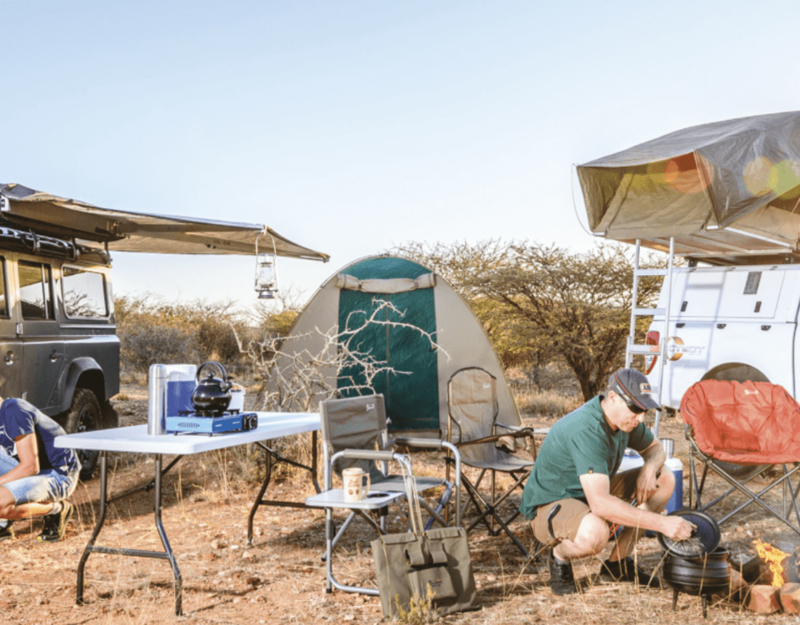 Wilderness Safaris chooses locations that are remote, offering the wilderness experience, but also places where their presence can make a difference. The Busanga Plains are just such a place and although WS does not profit from their lodges there, their focus is to provide important practical assistance with anti-poaching operations and maintain a presence there when the camps close for the rainy season. The focus is on low-density luxury camps in order to retain the remote feel of the area. A two-hour flight from Windhoek to the northeast brings us to Lusaka’s quiet and rather quaint Kenneth Kaunda International Airport. Customs controls are stress-free and friendly and soon we are off to Lusaka for the night. Flying out to Kafue National Park the following day, we marvel at vast stretches of water as we head northwest over the Lochinvar and Blue Lagoon national parks. Far below sparsely inhabited islands are surrounded by water and submerged roads are just visible. Half an hour later and any signs of human habitation fade away below us. The Lufupa River comes into view and after a total flight duration of 70 minutes we land at Shumba airstrip between beautiful trees. It is late afternoon and tour guide Aaron comes to greet us. After 20 minutes on the road and a sighting of oribi antelope we cannot drive further. In early June the plains are still flooded in parts. We pull on Wellies, load our minimal luggage into waiting mokoros and with a gentle swoosh we are off. It’s hard to imagine that everything transported to the camp goes this same route by mokoro from April to July! There is no sound other than the rhythmical soft splash of the poles propelling us forwards. Malachite Kingfishers dart between the grasses and the sun begins to slide towards the horizon. By the time the mokoro docks on a sandbank 45 minutes later I’m nearly asleep! It has been a long day.After another 20-minute drive, as a full orange moon detaches itself from the horizon, we finally arrive at Wilderness Safaris’ Shumba Camp, home for the next five days.We are warmly welcomed by General Manager Ondyne Dobeyn and her team, and we introduce ourselves around the fireside before a delicious dinner is served. As we drift off to sleep, a lone puku antelope whistles in the mist outside. Mist is something we are looking forward to as it makes for unique photography on these plains. The next few days unfold at a gentle pace, spent on the river and on game drives, getting acquainted with the unique birdlife in these parts. Our first ‘lifer’ is the Rosy-throated Long-claw, which we are thrilled to see quite often, although they blend in so well with the yellow grass. Magnicficent sunset at long palm island, Annabelle Venter. Next up in the lifers list is a small flock of Grey-crowned Cranes or Mahems, their Afrikaans name which exactly describes their eerie calls. Saddle-billed Storks, as well as Wattled Cranes, are found around almost every corner and we watch these birds catching barbels in a backwater. Huge flocks of Whistling Ducks with youngsters, and Open-billed Storks take to the air as our boat approaches. Pratincoles line the banks and we discover that this is where African Skimmers spend the winter months, when not nesting in Namibia!When on our first boat trip our guide Newton Mulenga shouts ‘they’re crossing, they’re crossing’ we have no idea what he is talking about. But we quickly learn that we should be on the look-out for the leaping red lechwe antelope that race to jump over the channel as we approach. This becomes a popular photographic pastime for us, trying to catch ‘the shot’! Another is trying to photograph the shy Half-collared Kingfishers as they dart ahead of the boat. Dodging hippos is a necessary task, but somehow they don’t seem to be as aggressive here as we have experienced them elsewhere. Newton reads them very well, but as I look back they are chasing us in the water! Small groups of buffalo graze on the floodplains, accompanied by egrets and Yellow-billed Oxpeckers. Wherever we look there is activity and there are herds of puku and red lechwe antelope. Busanga is famous for its leaping lions – channel jumpers of note. Even in the dry season there are water channels to be traversed, but now it’s still too wet and we watch a lioness attempting to hunt red lechwe before becoming bogged down in the marsh. She has a very small cub to feed as well as two teenage hangers-on from one of the other females, who is rearing her new litter nearer to the camp.This second female, known as the ‘killing machine’, is just bringing her two three-month-old cubs out into the open for the first time and Newton is really excited to see her new babies. She allows us to follow at a distance as she moves them to a new safe place. For two days we are the only guests at Shumba Camp and have the Busanga Plains virtually to ourselves. Busanga Bush Camp (BBC) is closed for renovations after some food damage (we were originally booked in there) but we visit the camp and meet the staff. It’s a lovely rustic camp on the edge of the tree-line, with just four tents. WHAT HAPPENS IN THE WET SEASON WHEN THE CAMP CLOSES? Busanga Bush Camp and Shumba Camp are open for only five months each year from June 1st to the end of October. After that, the summer rains begin and the black cotton soil makes driving impossible.After the last guests have been waved farewell, it’s ‘all hands on deck’ as the staff begin the process of securing the camp against nature and the elements. Since the lounge and dining room are open structures, all the furniture is moved to the guest tents which are zipped up and wrapped in plastic. One summer a lioness ‘broke into’ tent number 1 and raised her litter of cubs there! The staff was more than happy to leave her alone there.Most of the staff leaves the camp in November. Some go to other Wilderness lodges, even in neighbouring countries, to gain experience and receive training, while others do piece-work. Just three staff members remain in each of the two camps. Although the rains limit operational time and therefore income for the two camps, this is where WS plays a very important role in preserving this piece of paradise and its wildlife. WS maintains a presence all year round, and the staff assists the Zambian Wildlife Authorities (ZAWA) in their efforts to eradicate poaching. Wilderness Safaris supplies fuel and drivers for boats and vehicles, food and a support system for the ZAWA officials who stay at Kapinga Camp (near BCC). Busanga plains in the morning mist, ©Annabelle Venter. Shumba deck as the sun sets, ©Annabelle Venter. CHILDREN IN THE WILDERNESS (CITW) PROGRAMME IN ZAMBIANS runs its Children in the Wilderness programme from its Toka Leya Camp on the banks of the Zambezi River near Livingstone. Sinde village is the focus of the programme and the goal is to offer children a ‘hand-up, not a hand-out’. Groups of children are invited to visit the lodge for three or four days at a time to experience the bush and learn about sustainable conservation through leadership development. There is an eco-club at the school and a coordinator from WS visits the children between camps. WS has built two houses for teachers at the school in Sinde and a third house for the doctor. Painted reed frog, ©Annabel Venter. Shumba Camp, on the other hand, is a bit more luxurious and raised on boardwalks with a magnificent deck from which to view the plains and the full moon rising. It is set in a small island of trees in the middle of the floodplains, and it is also the centre of the Papyrus lion pride’s territory. Two nights before our arrival the pride had crossed the decks during the night leaving footprints in the morning dew. We spend the afternoons on our private deck watching lechwe and soaking up the silence. In the mornings we wake at six and our first thought is to see if mist is covering the plains. Sadly the mist evaded us until the last morning. The wonderful staff at Shumba is sourced mainly from the surrounding villages. The nearest one, where Newton grew up, is 94 km away. Newton’s father Idos was a well-known guide at Shumba and has been a big influence on his choice of career. Fred, the barman, is a great character and always ready with the day’s cocktail. He gives a demonstration of a local board game and does a mean imitation of a lion’s roar on a cow horn! Activities offered at these two camps vary according to water levels. Drives, boating and birdwatching are the main attractions at the beginning of the season (June and July). As the food plains dry up from August onwards, more extensive drives replace the boat trips, walks are optional and a balloon trip is a highlight, included in the price if you stay three nights or more. This later time of the year is also good for seeing roan and sable antelope move onto the dry floodplains. The Busanga Plains are a wetland paradise in the early season, and we’d love to return to experience the dry season. A herd of red letchwe watch us drift past, ©Annabelle Venter. Head waiter Chrispin Kibinda from Kasempa village has an interesting tale to tell of how he came to Shumba. As a young boy, he and three friends heard that a new lodge was being built and since work opportunities were non-existent, they decided to walk the 80 km to find the lodge they had heard about. They made a boat out of pieces of bark (it was April and very wet), slept in the bush with no shelter or food for two nights and arrived at the camp on the third day. Initially, Chrispin was told that he was too young, but then WS offered him temporary employment to help build the camps. He returned after further schooling and is now the only one of the original group of four who is still with Wilderness Safaris. He has a great personality and an infectious laugh, loves WS and plans to become a chef in the future! 1) Two days by road, travelling north from Windhoek, via Katima, Kasane in Botswana and across the border into Zambia at Kazungula. Some car hire companies allow crossing into Zambia with Namibian vehicles. 2) Fly Air Namibia: 3 times a week to Lusaka on a 2-hour fight, currently departing from Windhoek at 07h30. A registered taxi at the airport costs U$35 for the trip into town. Shuttles booked by a hotel are charged at U$25 per person. WHERE TO STAY IN LUSAKA? Flights depart from Lusaka for Busanga Plains at about 14h30, i.e. not necessarily after your international fight arrives. Co-ordination is essential! It’s a good idea to stay in one of the hotels close to a shopping mall as taxi fees are steep and the city is spread out. There isn’t really a tourist centre as far as I could establish, so somewhere like the Arcades Mall will give you a choice of restaurants and a bookshop. On Sundays, there is a colourful market in the car park at Arcades Mall. This article first appeared in the Spring 2017 issue of Travel News Namibia.